As we wait in hope for warmer weather over Easter thoughts of Christmas will be the last thing on your mind. But for those who like to plan ahead we are delighted to announce details of our annual Christmas Market Tour for 2013. This year we venture east to the state capital of Bavaria. 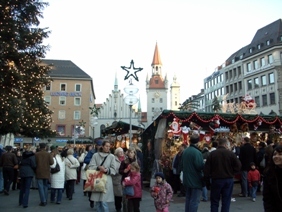 The Christmas Markets in Munich have been held in the Marienplatz since the 14th Century and visitors can expect to find unique Bavarian gifts and enjoy the traditional Lebkuchen (Gingerbread) and Glühwein (Mulled wine) favoured by those feeling the cold. Optional excursions include a visit to Bayerisch Eisenstein which straddles the German and Czech Republic border, its railway station is located in both countries! The town's railway museum is in a 7-track roundhouse dating from 1877 and houses over 40 trains. You may wish to join a tour to Garmisch-Partenkirchen, two towns forced together by Adolf Hitler in 1935 to play host to the 1936 Winter Olympics. 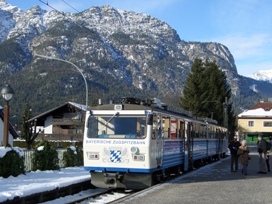 The area has one of Germany's four remaining rack railways, that takes you up the country's highest mountain, Zugspitz, to a height of 1,883m and a cable car can then be taken to the summit, weather permitting, to experience Germany's highest point. Your German InterRail Pass (included in the price) allows free travel on an optional excursion to Salzburg to enjoy this city's culture and it’s Christmas Market which dates back to the 15th Century. There will also be plenty of time to explore Munich itself, particularly its Christmas Market, based in the city centre in Marienplatz, or use your local and German InterRail passes to take travel further afield. Our homeward journey allows for an overnight stop at the popular summer resort of Königswinter, nestled between the Rhine and the Siebengebirge range (Seven Mountains), and our hotel for the night stands proudly on the river bank. This 8-day tour price is currently set at £1,240, but we must emphasise that this is a guide price only and subject to change as the exchange rate will not be set until 1st May 2013. We can accept bookings on the understanding that the deposit is fully refundable should you not wish to go ahead after seeing the final price. The Christmas Market tour offers a wonderful mix of festive sightseeing and shopping with plenty of culture and a sprinkling of railway content thrown in. You will have the services of a tour leader from London throughout the holiday. For the full itinerary see Christmas Market – Munich on our website or contact dan.may@ffestiniogtravel.co.uk by email direct or call him on 01766 772050.